Empey Pet Friendly Rental Home is set in Carnelian Bay and offers a tennis court and barbecue facilities. Guests staying at this holiday home have access to a fully equipped kitchen. The holiday home comes with a TV and 4 bedrooms. 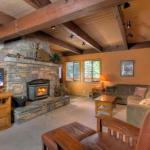 Reno is 40 km from Empey Pet Friendly Rental Home while South Lake Tahoe is 34 km from the property. The nearest airport is Reno-Tahoe International Airport 40 km from the property.